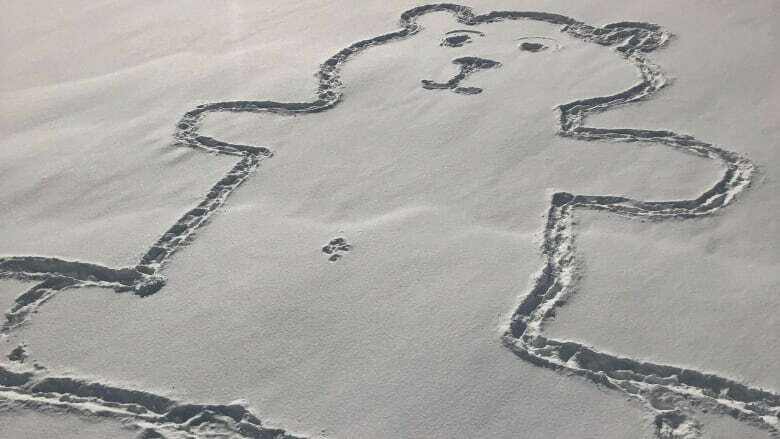 CBC News successfully contacted the artist behind the snow bear that appeared this week on Montreal's Lachine Canal, and asked her the question on the minds of many: How did the snow bear get its belly button? The bear was wide — at about 12 feet — making the jump from the bear's outline to its belly button almost impossible. CBC News spoke via text message with Valérie Duhamel, the maker of the snow bear, who said she was surprised by the media attention her creation has received. "Yes, it was five snowballs thrown in the same place. And I never would have thought my bear would be all over the media," wrote Duhamel. A number of people following the snow bear mystery reacted to her impeccable aim with awe, impressed that all five snowballs landed perfectly in the centre of the bear. Ocram’s Razor for the win. NO WAY!!! That’s some serious aim. The bear was made on Tuesday night, and was located near Beaudoin Street in the Montreal neighbourhood of Saint-Henri. Unfortunately, it was destroyed by the wind about 24 hours later. A spokesperson for the Lachine Canal reminds Montrealers that walking on the canal is illegal in the winter because of safety concerns.